Chief executive Sundar Pichai, in a blog post outlining the company's artificial intelligence policies, noted that even though Google won't use AI for weapons, "we will continue our work with governments and the military in many other areas" such as cybersecurity, training, or search and rescue. Pichai set out seven principles for Google's application of artificial intelligence, or advanced computing that can simulate intelligent human behavior. He said Google is using AI "to help people tackle urgent problems" such as prediction of wildfires, helping farmers, diagnosing disease or preventing blindness. 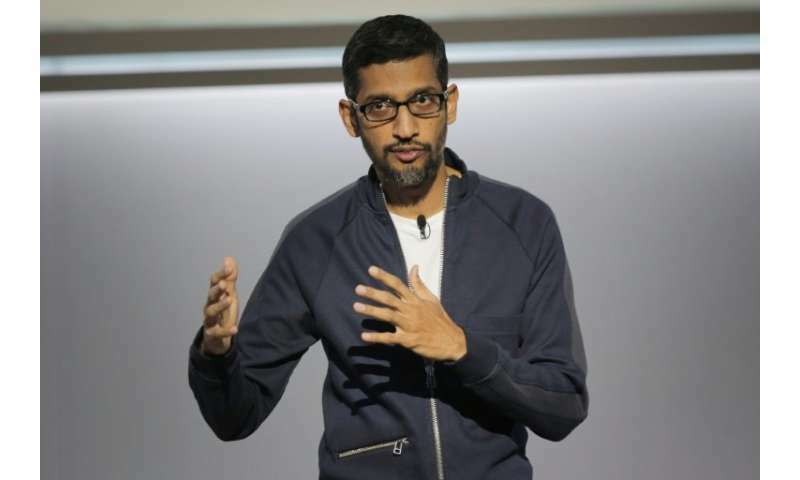 "We recognize that such powerful technology raises equally powerful questions about its use," Pichai said in the blog. "How AI is developed and used will have a significant impact on society for many years to come. As a leader in AI, we feel a deep responsibility to get this right." The chief executive said Google's AI programs would be designed for applications that are "socially beneficial" and "avoid creating or reinforcing unfair bias." He said the principles also called for AI applications to be "built and tested for safety," to be "accountable to people" and to "incorporate privacy design principles." Google will avoid the use of any technologies "that cause or are likely to cause overall harm," Pichai wrote. That means steering clear of "weapons or other technologies whose principal purpose or implementation is to cause or directly facilitate injury to people" and systems "that gather or use information for surveillance violating internationally accepted norms." Google also will ban the use of any technologies "whose purpose contravenes widely accepted principles of international law and human rights," Pichai said. The Electronic Frontier Foundation, which had led opposition to Google's Project Maven contract with the Pentagon, called the news "a big win for ethical AI principles." "Congratulations to the Googlers and others who have worked hard to persuade the company to cancel its work on Project Maven," EFF said on Twitter. Ryan Calo, a University of Washington law professor and fellow at the Stanford Center for Internet & Society, tweeted, "Google's AI ethics principles owe more to (English philosopher Jeremy) Bentham and the positivists than (German philosopher) Kant. Nevertheless, a good start." Calo added, "The clear statement that they won't facilitate violence or totalitarian surveillance is meaningful." The move comes amid growing concerns that automated or robotic systems could be misused and spin out of control, leading to chaos. At the same time, Google has faced criticism that it has drifted away from its original founders' motto of "don't be evil." But Google is believed to be competing against other tech giants such as Amazon and Microsoft for lucrative "cloud computing" contracts with the US government, including for military and intelligence agencies.